Companies that are planning their SAP S/4HANA journey are looking for structured information and guidance to chose the optimal way for their transition project. To help companies on their journey, SAP has released SAP Activate, an innovation adoption framework that is designed for implementation of SAP S/4HANA and supports all deployment scenarios (on cloud, on premise, or hybrid). SAP Activate provides customers with ready-to-run business processes, methodology and tools to support their transition journey. What SAP Activate brings to your transition journey? Now let’s take a look at each of the pillars of the SAP Activate framework in little more detail to improve our understanding of what each part of the framework brings to the table. In later section we will look at how these pillars work together and support you during your project. Best Practices – SAP delivers ready-to-run business processes for SAP S/4HANA business transactions and analytics as well as best practices for migration and integration into other solutions, such as SAP SuccessFactors or SAP Ariba solutions. The best practices help customers minimize risk, accelerate time to value, and reduce the total cost of implementing SAP S/4HANA as well as continue innovation even after go-live. 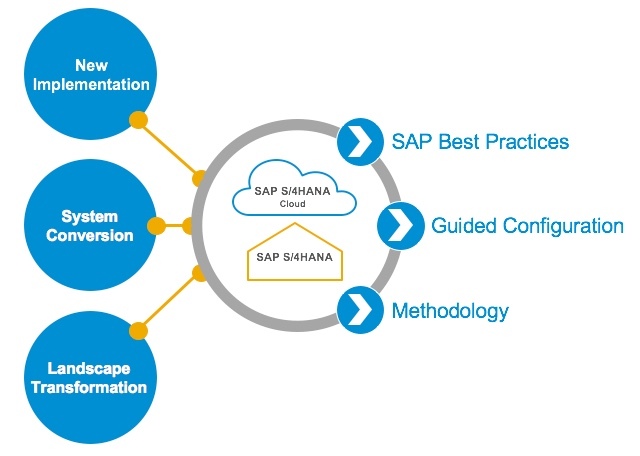 Methodology – SAP Activate methodology is a modular and agile framework for implementation or migration to SAP S/4HANA (it also supports other SAP solutions, but for purposes of this post we will focus on SAP S/4HANA). It provides project teams with detailed, prescriptive steps charting path through entire transition project. Additionally, methodology provides project, solution and technology specific guides, links, templates and accelerators for all phases of your project. Tools for Guided Configuration – SAP delivers tools that support customers in execution of implementation steps like solution configuration, testing, key user enablement, change management, etc. SAP provides tools that for specific deployment option in your transition. For example in the S/4HANA cloud implementation the Guided Configuration capabilities are built directly into the SAP S/4HANA solution and offer capabilities for viewing activated scope, configuration, testing and enablement. In an on-premise implementation projects you will leverage capabilities of SAP Solution Manager 7.2, full-fledged toolset that has been enhanced to provide the best implementation and operations experience for SAP S/4HANA customers. Now that we have introduced all three pillars of SAP Activate, let’s take a look at how you apply them in an SAP S/4HANA transition. In this example we will discuss the approach for on-premise implementation of SAP S/4HANA solution. The SAP Activate concept is applicable in all transition scenarios (e.g. New implementation, System Conversion and Landscape Transformation), but for simplicity we will focus on just new implementation on-premise to demonstrate how SAP Activate supports you. The SAP Activate approach follows six phases to support customers on their SAP S/4HANA transition journey. The image below outlines key activities and objectives of each phase. Let’s talk about few highlights that differentiate the SAP Activate approach. Discover – The first phase is focuses on customer’s discovery of the solution, its benefits and planning the transition journey. In this phase, customers are encouraged to discover the capabilities of the solution through the SAP S/4HANA trial system. Before the phase is completed you will develop the strategy and transition roadmap for your journey. Prepare – In this phase the project is formally kicked-off, implementation plan is prepared and project team is on-boarded. Before entering into the next phase, the project team will trigger installation and activation of SAP Best Practices in the Sandbox system. Explore – The project team readies the Sandbox system for detailed fit/gap analysis workshops. Then you conduct the fit/gap analysis workshops to confirm the fit of the Best Practices processes and to identify delta requirements and gaps. The team confirms the gaps and captures specific solution requirements and design in SAP Solution Manager 7.2. This approach is different from the traditional ASAP blueprinting of the past. The goal of fit/gap analysis is to re-use best practices processes, while allowing for flexibility to build additional capabilities on their foundation. This approach has been proven to significantly shorten the Explore activities and positively impact total cost of implementation. Realize – project team will use agile iterations to incrementally build and test an integrated business and system environment. The project team will also prepare data loads and start readying for solution adoption activities such as key user training and end users on-boarding. During the Realize phase the project team will continue to use SAP Solution Manager 7.2 to document and test the solution so the documentation is ready for solution operations after go-live. Deploy – In this phase the project team sets up the production environment and perform final checks. When you’re ready, you conduct the cutover activities and switch business operations to the new system. The project team will also turn the solution over to operations team for running the solution. Run – You’re running your new digital core and you can continue building additional digital capabilities on solid foundation of SAP S/4HANA. SAP delivers the SAP Activate content in an easy to use tools that offer simple access to the methodology content and Best Practices business process content. The methodology content is available in the form of implementation roadmaps in the Roadmap Viewer tool. Roadmap Viewer is Fiori-based environment that enables you to access the detailed methodology content that guides you on your SAP S/4HANA Journey. The methodology content gives you access to project accelerators like guides (for example, how to run fit/gap analysis workshops), templates for all key project deliverables and relevant product implementation knowledge that you will needed on your journey. All SAP Activate methodology content is structured into hierarchy following the journey – Phase > Deliverable > Task. 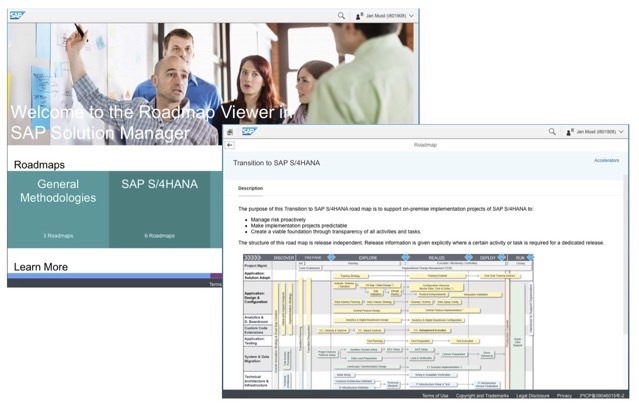 You can access Roadmap Viewer at https://go.support.sap.com/roadmapviewer/, remember to log into the tool as some content is only available to you when the tool confirms your access level. The SAP Best Practices Explore provides access to the best practices for SAP S/4HANA and other solutions. This Fiori based environment lets you browse through the Best Practices assets, download the required content and search for specific assets. Reference earlier blog from Sven in which he introduced the environment. You can access the SAP Best Practices Explorer here. I hope this blog helps you understand the scope and coverage of SAP Activate for SAP S/4HANA. We have also posted article in SAP insider that discusses the approach. Feel free to post questions or comments below this blog. I also invite you to join the SAP Activate Jam where you can find more methodology content and reach the experts (request access at http://bit.ly/SAPActivate). Hey guys – I have a question from Boeing. Is there a defined point in / or between Prepare and Explore when a project migrates / moves from sandbox work to Development instance? I must confess upfront that I have the same position as I am also learning myself. But, I’d still like to help here. My understanding is that Development Environment is used from the Realize phase on wards. If there are any configurations, developments etc. from the Sandbox, that can be re-used as is, they may be transported into the new Development box at the start of Realize phase.